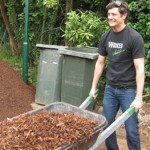 Yesterday, WICKED Australia cast members, swapped their costumes for shovels as they rolled up their sleeves and got their hands dirty at Taronga Zoo to support WICKED Day. 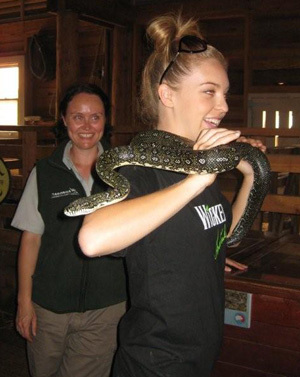 WICKED Day is all about giving back to the community and given the strong themes about how animals interact and are treated in the show, the WICKED cast were more than happy to offer Taronga Zoo some volunteer support. 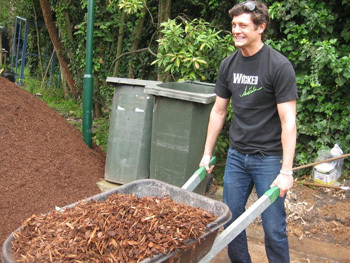 The WICKED cast assisted Taronga Zoo with their Backyard to Bush project, which involved a variety of landscaping activities to ensure that this precinct remains a pristine Australian bush habitat for the range of native Australian animals such as kangaroos, emus, as well as goats, pigs and cattle dogs that roam within. 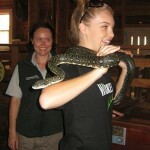 Cast and crew members were also able to get in touch with their WICKED side by handling and refurbishing the enclosures for a selection of cold blooded reptiles including the diamondback snake, the blue tongue lizard and the shingleback lizard. Lucy Durack and Rob Mills were also lucky enough to feed two of Taronga Zoo’s tallest inhabitants, the thrillifying giraffes. In addition to the volunteer activities that took place yesterday, WICKED has been undertaking collections in the theatre to support the endangered Tasmanian Devils. 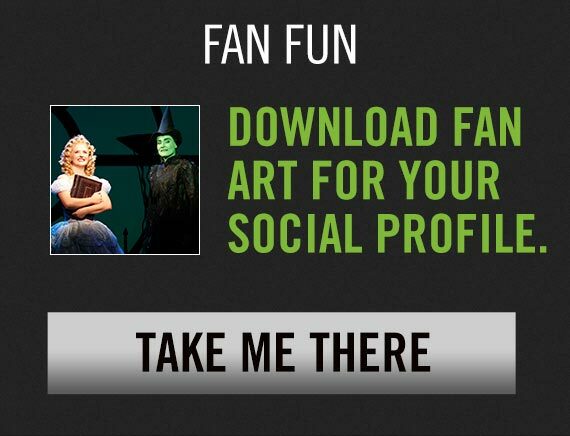 For those fans wanting to celebrate WICKED Day BOOK TICKETS to the matinee performance on Sunday 1 November and come dressed as your favourite WICKED character. There will be on the spot WICKED prizes for the Best Dressed prior to the commencement of the matinee. Winners will also have the opportunity to have their photo taken with the cast after the show.